For those wishing to tighten up on their personal and professional security online, Password Generator Pro is a program which offers a way to generate strong passwords without the user having to really do much thinking. The passwords aren't exactly random, and the program gives you the output as an easy way to remember the passwords: Alpha Beta Charlie One Five or ABC15 as an exactly. Password Generator Professional can also provide you with the Hex key if you want, with full support for copying your generated passwords to the Windows clipboard. As an added option, Password Generator can also generate usernames for you. 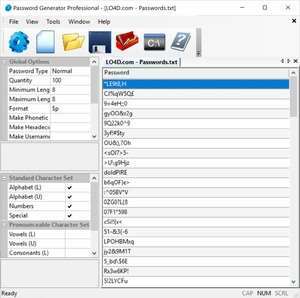 Password Generator Pro 5.552 is a shareware program and can be used as a demo to try the software until the free trial period has ended. A full version of the program is available after the trial period ends. For security reasons, you should also check out the Password Generator Pro download at LO4D.com which includes virus and malware tests. Additional screenshots of this application download may be available, too.